For those of us who will be working then, it can be downloaded as a podcast or listened to online after the broadcast. 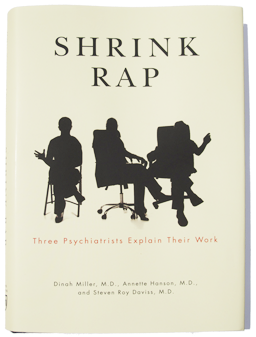 I'm reading Shrink Rap now. It is a wonderful book. Clear, thoughtful, and a true picture of current psychiatry. Well done, Dinah, Roy, and Clink. Looking forward to it! If you're in the second hour, is 3pm ET the start of the first hour or second? I'm probably a BIT late asking this as there's two hours til showtime lol. Congrats shrinkrappers! Saw your book featured on NPR's site! Finished Shrink Rap. It is extremely fair and balanced. It gives a true picture of psychiatry and the problems and issues psychiatrists (and their patients) face. I wonder only how it could be published in paperback for so little. I would expect the cost to be triple what it is. You Shrink Rappers deserve thanks for all that went into this. Thanks, all. Jesse, the publisher suggested the price and we said sure. Apparently, Amazon deeply discounts, so the $19.95 SRP goes down to under $13. I'm hoping that means it gets into more people's hands. Doing the NPR show was fun. Susan and Priska (producers) were just great, and I was amazed at how Neal multitasks while asking great questions and managing callers.